We´re getting ask a lot of genetic questions and where you can read about the basics. In our opinion it is mandatory to achieve this knowledge if you want to breed our loved Boa constrictor imperator to avoid unwanted results as health issues or an “overproduction” of mixed wildtype “poss het” animals! Thats why we decided to add this chapter to our website and are hoping it´s helpful for you. 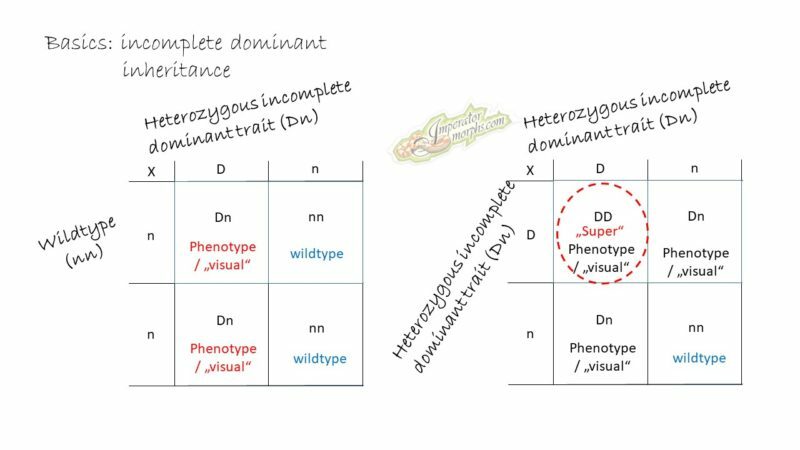 Every now and then you can read the word phenotype and here we like to show you what it´s about and what´s the difference to genotype. A phenotpye only describes the appearance of an animal but says nothing about the genes that might not be present visual. A genotype on the other hand is describing all genes whether its heterozygous, homozygous, dominant or recessive. 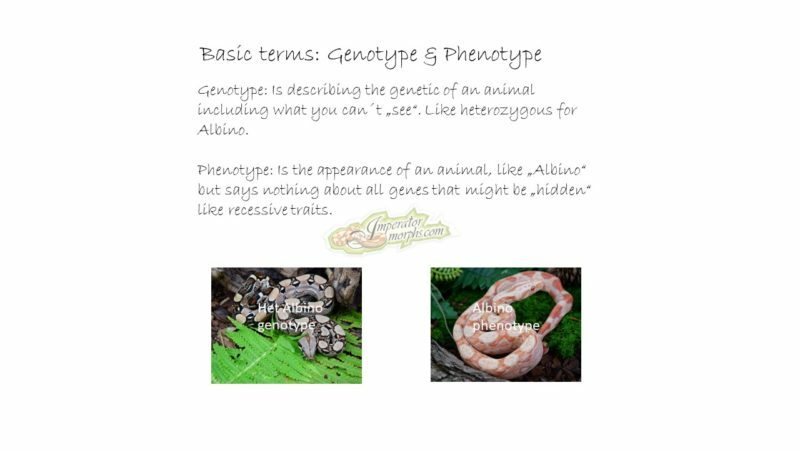 You can have a phenotype Albino, but the genotype is homozygous Albino and heterozygous Anery. 50% and 66% possible het. animals are causing so many of your questions and we hope this chart will help a bit to understand more of it. To get to see a recessive genetic as visual, also called phenotype, it is necessary that both chromosomes of the chromosome pair consist out of the recessive gene à RR in this shown example. In our example here we´re breeding a heterozygous (Rn) animal to a heterozygous (Rn) animal. 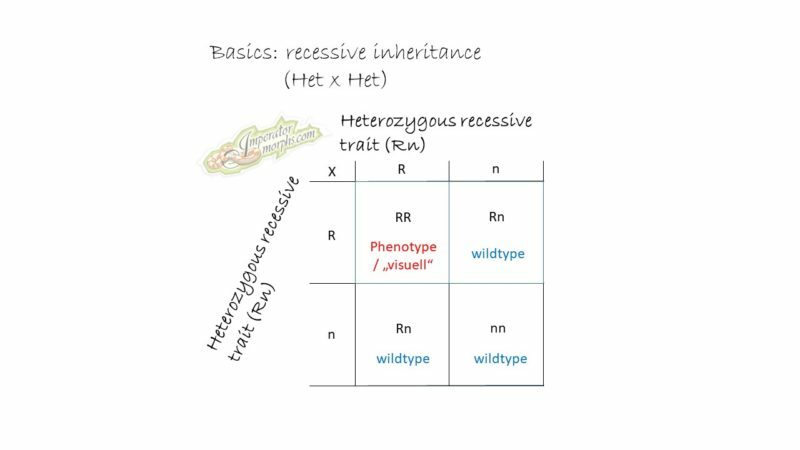 Another form of inheritance, beside the recessive morphs, is the dominant inheritance. The dominant genes are much „easier“ to work with cause you see visual (phenotype) animals straight away and this already if its just present heterozygous! Arabesque, Scoria, IMG (Azabache), Inca. As mentioned above dominant traits are always visual even if present heterozygous. So there´s no need that both parents are carrying the same trait like it´s necessary to receive recessive phenotypes (visuals). So for all genes mentioned above, this example works the same. 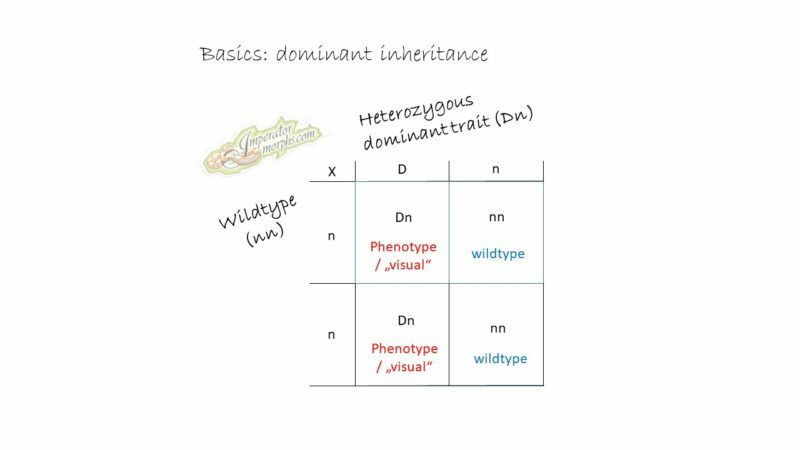 Another form of inheritance, beside the dominant morphs, is the incomplete dominant inheritance. The incomplete dominant genes are „easier“ to work with cause you see not only visual (phenotype) animals as heterozygous, you can also identify the homozygous animals which are the so called „Super“ morphs. The incomplete dominant inheritance gets often mixed up and called co-dominant, like I´ve been teached this too many years ago. However this isn´t the correct term. In fact the way it works hasn´t changed, it´s just the declaration. Motley, Hypo, Jungle, Aztec, Roswell, Keltic, Key West, Labyrinth. Some like to put Hypomelanistic on the dominant morphs list. It doesn´t change the way it inherits, but in our opinion there´s an obvious „Super Hypo“ that keeps us from putting them on there. As mentioned above incomplete dominant traits not only express as visual as heterozygouse. There´s also a so called „Super“ form existing which is the phenotype of the homozygous form!